Perfect for your next walk or awareness fundraiser. Remember every step when you look at this beautiful 3-D shoe charm. 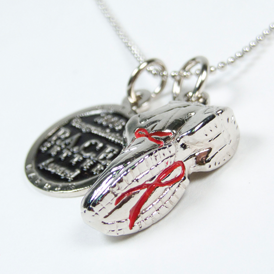 Awareness ribbons adorn the shoe on the sole, sides, and heel of the charm. Ribbons can be filled with enamel in any PMS color. Add a custom charm to match with your organization's logo. Please call for a custom quote.